Alfred Hackman was born at Fulham on 8 April 1811 and baptised at All Saints’ Church there on 11 August. He was the eldest son of Thomas Hackman, the parochial vestry clerk, and his wife Elizabeth Hickmanns. On 25 October 1832 Alfred Hackman, at the age of 21, was matriculated at the University of Oxford from Christ Church, "serviens", i.e. working as a servitor to help pay his way. He gained his BA in 1837. He obtained a temporary post in the Bodleian Library in 1837, and was connected with the library for more than 35 years: he was responsible for the greater part of the general catalogue of printed books, which came out in 1843, and edited the 1851 supplementary volume. He is famous for having forgotten to catalogue the large tome on which he had been accustomed to sit for many years. 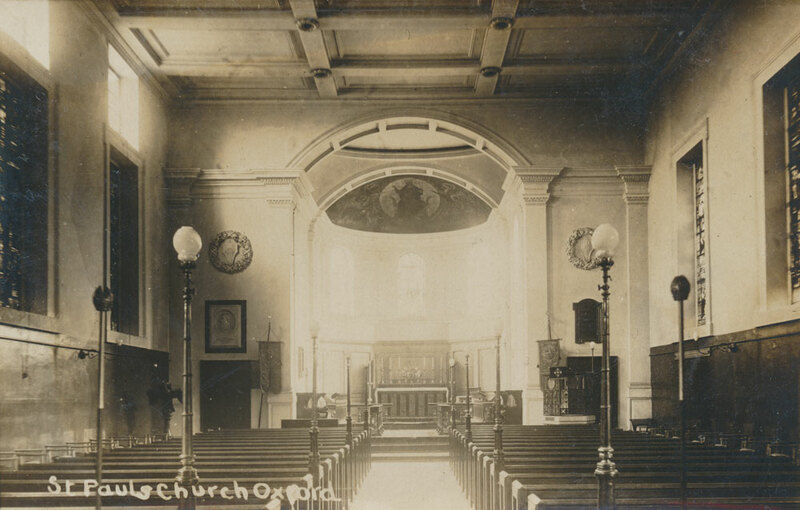 In 1837 Hackman also became chaplain of Christ Church, and curate to the Revd Henry Cary at St Paul’s Church, which had opened in Walton Street, Oxford two years earlier. In 1839 Christ Church appointed him Vicar of Cowley. His father died at Fulham in 1844 and his mother in 1845. In 1844, Hackman was appointed Vicar of St Paul’s Church, Oxford; but for the most part curates attended to this parish, while he concentrated on his work in the Bodleian Library. He never married, and continued to live at Christ Church, where he was also Precentor from 1841 to 1873. In the 1851 census he is simply described as living at Christ Church and having cure of souls, but in 1861 his address was more precisely given as 1–3 Chaplains’ Quad, Christ Church, and his occupation as Vicar of St Paul’s, Oxford. Early in 1871 he ceased to be Vicar of St Paul’s Church, and at the time of the census that year he was living in Christ Church New Buildings and described as a clergyman of the Church of England without cure of souls. Meanwhile his brother William G. Hackman, a clerk in the Bank of England was living at Chomley Villas, Portsmouth Road, Long Ditton, Surrey with his wife Caroline and his brother Adolphus Hackman, another Church of England clergyman without cure of souls. † Alfred Hackman died at his brother’s house at Long Ditton on 18 September 1874, and body was brought back to Oxford. His funeral was held at St Paul’s Church on 23 September, followed by interment in St Sepulchre’s Cemetery (burial recorded in register of St Paul’s Church). The remains of the deceased were brought to Oxford and laid with some ceremony in the choir of St. Paul’s Church on Tuesday evening. The body was enclosed in three coffins, the outer one being highly polished, and the whole of the funeral arrangements were entrusted to Mr. Waldie, of Broad-street. At two o’clock on Wednesday St Paul’s Church was crowded in every part, the funeral service having been announced to commence at that hour. The pulpit and choir had been draped with black, and several lighted candles were placed around the coffin. The choir boys had been strengthened by others from the choir of St. Barnabas, and were under the direction of Mr. Moss, and the whole of the service was choral. Among the Clergy in surplices were the Revs. W. B. Duggan (Vicar of St. Paul’s), M. H. Noel (Vicar of St. Barnabas), Dr. Warburton, G. N. Freeling (Rural Dean and Vicar of Holywell), James Price, H. Jones, Cecil Deedes (Vicar of St. Mary Magdalen), G. L. Kemp (Vicar of St. Frideswide), S. A. Smith, C. B. Tyrwhitt, E. P. Barrow, E. C. Dermer (Vicar of St. Philip and St. James), R. M. Benson (Vicar of St. John the Evangelist, Cowley), A. T. C. Cowie, A. Simpson (St. Edward’s School, Summertown), C. N. Robartes, W. Morrison, and many others. The Vicar of St. Paul’s read the sentences and the lesson, while the Vicar of St. Barnabas precented. The Rev. R. M. Benson ascended the pulpit after the singing of the hymn, “Let saints on earth in concert sing,” and delivered an address of a very impressive nature, in which he alluded mainly to the responsibility of a priest to his parishioners and the responsibility of the parishioners to their priest, and instancing the life and ministrations of their deceased brother as an example of a truly Christian pastor. The hymn “Brother, now thy toils are over,” having been sung, the body was borne on the shoulders of eight bearers to the front of the Church, where a procession was formed of the Choir and Clergy, headed by a large cross borne aloft. Immediately following the coffin were the mourners — The Rev. Adolphus Hackman, Mr. and Mrs. Wm. Hackman, Mr. Henry Hackman, Mr. Holman Hunt, Mr. Cyril Hunt, Rev. W. Price, Mrs. Combe, Mrs. Ridgway, Miss Norris, Miss Hill, the Misses Hall, and Mrs. Deakin. The Rev. H. O. Coxe and a number of the staff of the Bodleian Library were also present. The pall was borne by six former Curates of St. Paul’s, namely, the Revs. Dr. Warburton, D. Royce, Canon Ridgway, D. Trinder, E. P. Barrow, and H. Bullocke. As the procession passed along to the Jericho Cemetery, the 51st and 139th Psalms and the hymn, “When our heads are bowed with woe,” were sung, and on arriving at the grave the interment sentences were said by the Rev. W. B. Duggan. The hymns, “Cease, ye tearful mourners,” and “Jesus lives! no longer now,” were sung, and on the departure of the relatives and friends of the deceased and the Clergy many took a last farewell look at the coffin as it lay in the grave. The spot chosen for the interment is one which is surrounded with the remains of many of the deceased’s most intimate friends, and it was his wish that it should be his last resting-place. Some beautiful wreaths of flowers were placed on the coffin after it was lowered into the grave. Large numbers of people witnessed the funeral ceremony in the Cemetery, but owing to the excellent arrangements made little or no damage was done. We believe it is intended to collect subscriptions for the purpose of erecting a memorial over the grave of the deceased, to perpetuate the memory of one so cherished, especially in the north of Oxford. Much regret has been felt throughout the University and City at the announcement of the death of the Rev. Alfred Hackman. Mr. Hackman was formerly Chaplain and Precentor of Christ Church, Sub-Librarian of the Bodleian Library, and Vicar of St. Paul’s, Oxford, all of which appointments, however, ill-health had previously compelled him to resign. He graduated in 1837, and passed his M.A. degree in 1840, being appointed to the Precentorship in 1841. He became first connected with the Bodleian in 1837 as an assistant for the general catalogue, and after a long period of zealous devotion to the interests of the Library, extending over twenty-five years, he was appointed by Convocation, in 1862, to one of the Sub-Librarianships vacant by the promotion of the Rev. H. O. Coxe, M.A., to the Librarianship. The appointment was preceded by a long discussion in Convocation, which led to the abrogation of the provision in the statutes forbidding the holding of the cure of souls by the Librarian or Sub-Librarians without special licence from the curators. Mr. Hackman was the author of the catalogue of the Tanner MSS. in the Library, and faithfully discharged the onerous duties appertaining to his office until a short time ago. He will be held in long and pleasant remembrance by all frequenters of the Bodleian for his great courtesy to those exploring its treasures, and for the kindly assistance he so willingly rendered to all who sought it. He was ordained by the Bishop of Oxford Deacon in 1837, and Priest in 1839, and was Vicar of St. Paul’s from 1844 to 1871. He was universally beloved in his Parish, and was regarded as one of the most zealous and devoted clergymen to be found in the Diocese. He was, until his strength failed him, a powerful and impressive preacher, and his genial manner and thorough kindliness of heart endeared him to all who knew him. He was much esteemed in his College, and was most popular both in the University and City. Hackman’s wealth at death was nearly £200.